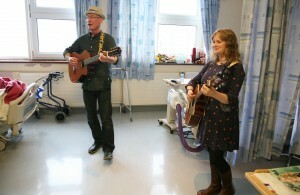 Based on evidence around the positive impact of music on wellbeing, WHAT brings live music to the bedside of patients through its Healing Sounds on the Wards programme. Liam Merriman, who has trained with Musique et Sante in France, mentors musicians who are new to this practice to engage patients musically with sensitivity and empathy. The Healing Sounds in the Foyer programme presents lunchtime performances by a range of musicians from different musical genres. The performances lift the spirits of staff, patients and visitors to UHW and link with Culture Night, World Music Day, Bealtaine and Well festival of arts and wellbeing amongst others. The programme is sponsored by AIB.